The OMR technology captures the black and white data on the forms for easy, simple and accurate use. 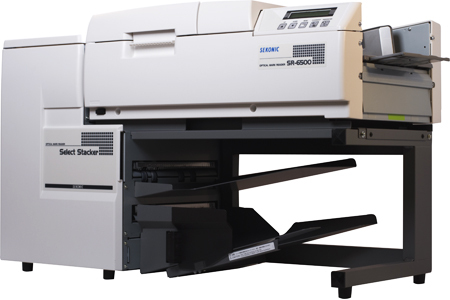 Sekonic SR 6500 has a reading speed of approximately 5,500 pages with built-in select stacker. It can be connected with USB and fully compatible with SR-5500 and SR-900/900`0. Sekonic SR 6500® will help you create and administer online surveys, evaluations, registrations, guest books, ballots, information request forms, and anything else that will pull in some really useful information. And you don't have to learn HTML to do it. Remark Web Survey makes it easy and affordable for anyone to create, publish and gather results from online forms. HB pencil (no. 2 pencil), Ballpoint pen or marker (black or blue) when equipped with optional ink read head Mark position format: 6/inch(1/6"), 5/inch(0.2"), 4/inch(0.25"), 3.3/inch(0.3") selectable. Note: Two kinds of 0.2" sensor head compatible with NCS scanner and Sekonic scanner are prepared. Read system: Reflective read head is used (the same as the SR-600/730 models). Note: New mark recognition system is adopted so rough check marks as well as usual bubble marks can be read. Density level: Internal 256-level. 16-level user threshold. Mark Position Format: 1/6" 0.2",0.25"
The SR-6500 can process either 3,500 or 5,500 forms per hour. These two workhorses have the ability to read full page forms, with up to 48 columns and 109 lines or 5,232 markings. You can double this capacity by adding the duplex read head option, permitting the scanner to read both sides of the form in one single pass. The SR-6500 use OMR (Optical Mark Recognition) technology which has an error rate of less than 1%. OMR is the preferred method to scanning forms as it processes forms at a relatively high speed, is dependable, and requires very little human intervention. The functional + below-mentioned function of SR-6500 addition--- High speed processing 5500/actualizing the time Reading adopting new technology for processing. Mass in data both sides reading type preparation. Input job time was shortened more. High The selection stacker which is convenient to re-check In stacker, reading OK seat (lower position) with reading NG or misprint entrance seat (upper tier) Being automatic, the distribution. It can depend on same re-check. Various tests of university and class appraisal and completion register, course investigation and application vote, in various questionnaires. The OMR technology captures the black and white data on the forms for easy, simple and accurate use. Sekonic SR 6500 has a reading speed of approximately 5,500 pages with built-in select stacker. It can be connected with USB and fully compatible with SR-5500 and SR-900/9000. Sekonic SR 6500® will help you create and administer online surveys, evaluations, registrations, guest books, ballots, information request forms, and anything else that will pull in some really useful information. And you don't have to learn HTML to do it. gsrthemes9: Kinvexy - Responsive HTML5 / CSS3, Simple, Clean and Professional Corporate Theme for Multipurpose Use.